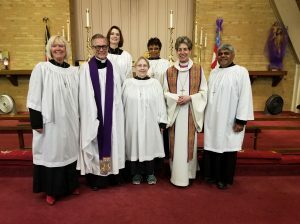 Bishop Katharine Jefferts Schori visited St. Christopher, Fort Worth, March 20-21, 2019. 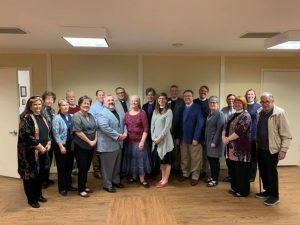 She celebrated and preached at a Eucharist and spoke at the Lenten Soup Supper on Wednesday, March 20, and met with the diocesan clergy on Thursday, March 21. 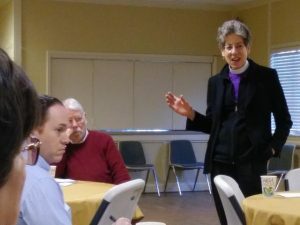 Bishop Jefferts Schori played a significant role in the continuation of this diocese following the departure of a former bishop, many clergy, and several lay leaders from The Episcopal Church. She called a Special Meeting of the Convention at which a new bishop was elected and other leadership offices filled. Watch her sermon below or on the diocesan YouTube channel. Watch a 40-minute video of Bishop Jefferts Schori’s Soup Supper presentation, in which several people from local congregations talk about ministries across the diocese. You can watch it below or on the diocesan YouTube channel.